This activity enables you to select the entity variable to act as the data handle to access and plug in different data provider service technologies. 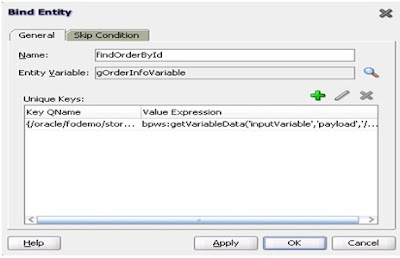 The entity variable can be used with an Oracle Application Development Framework (ADF) Business Component data provider service using service data object (SDO)-based data. The entity variable enables you to specify BPEL data operations to be performed by an underlying data provider service. The data provider service performs the data operations in a data store behind the scenes and without use of other data store-related features provided by Oracle BPEL Process Manager (for example, the database adapter). This action enhances Oracle BPEL Process Manager runtime performance and incorporates native features of the underlying data provider service during compilation and runtime. Note: This activity is only supported in BPEL 1.1 projects. Figure A-6 shows the Bind Entity dialog.